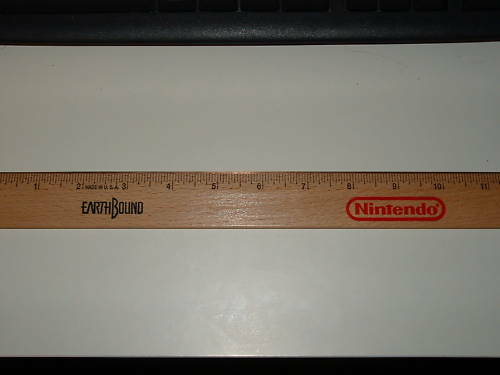 A few weeks ago a super-rare EarthBound ruler (used as a promotional item back in 1995) sold on eBay for quite a lot. Word about it spread throughout gaming sites, so someone else who had one put their ruler up for auction too. The seller is new to eBay, so if you’re interested in the ruler it’s probably a good idea to ask plenty of questions and do plenty of research beforehand. But if you were sad that you missed the last EarthBound ruler, this is your rare second chance at one! I am the seller! I would be more than happy to answer any questions. As the post says, I am new to ebay so I can understand if any potential buyers might feel a little apprehensive. Ask and I will answer! And if the last one went for $776 then $500 is a steal isn’t it? Could you tell us where you got your ruler, Wool-Z? I’d like to know from whence it came. @KingDarian: My mom gave it to me back in ’95, she works at a newspaper and I believe she got it from a press kit sent to somebody else in the office. I mentioned it was probably better to start it at zero because I’ve watched a lot of stuff in the past and when something like this situation happens it can be very hit or miss for the seller and basically waste time and money. For example, last year the giant Mr. Saturn plushes came out, and one really excited person paid $800 for one while everyone else was paying like $150 (and they regretted it just minutes after making the bid). The person who sold the $800 one then put another one on eBay, this time with the price at $2000, trying to ride on the coattails of the $800 one. A year later, it STILL hasn’t sold, even after its price has lowered into the $600s, which is even less than that first one sold for. Basically, in cases like this, if you want to ride the coattails of previous auctions, it might be wiser to let the price dictate itself. Plus, if you start at a lower price and know it’s going to get attention, sticker shock won’t scare as many people away if the starting price is lower. These rulers don’t look that hard to fabricate. I’d be careful. Not implying anything about Wool Z’s auction, but if I saw a bunch of these start popping up, I’d be weary. Wow, I’m surprised at the sudden surge of these. Seems like right after I posted about mine, they all come out of hiding. @Mato: I very much appreciate the advice, like I said before I’ve never sold anything on ebay before so the only guideline I had to go by was the previous auction. And I’ve decided to take your advice: the starting bid has been drastically reduced. Have at it folks! I was at Office Depot the other day, and I came across a small bin full of plain wooden rulers. I got curious and looked through to see if any were similar to the EB rulers, but none quite have that same texture I’ve seen all the EB ones have. Wool-Z’s definitely checks out in my book. I don’t doubt it’s legitimacy. Another thing worth considering is… that first one had the “Wow! I’ve never seen this piece of merchandise” effect going for it to drive up its price. Now we are starting to see more of these and that is killing that high price quickly. You’ll probably still make a few hundred bucks off of one of these because it is a rare piece of merch, but I wouldn’t get my hopes up with the thought of making any where near as much as the first one sold for. To add an example to what Lothis said, there was an EB display card that showed up a few weeks ago that nobody had ever seen before. It sold for over $300. Then a second one was put up and it only sold for $77. I will buy it for 800$ hows that? @Lol: I doubt you’re serious but in case you are I’ve added a buy it now price for $800. Neonix must be joking. He gave me and others endless grief last month about how easily the display card could be reproduced (http://earthboundcentral.com/2010/02/earthbound-display-card-for-sale/)…and now he asserts that five minutes at Office Depot is sufficient to claim, “yep, it’s genuine”? @Carl: I did not intend for my anecdote to be any sort of evidence or research into the validity of the ruler. It was coincidental that I was looking at rulers the other day, and I felt like mentioning it. Then I read Vinny’s comment and added my opinion about it. it’s just unfortunate that the two tidbits happened to come out that way. My bad. To clear it up, I don’t think they are that hard to fake, but Wool-Z’s looks just like all the others we have images of. So if it is fake, it’s a really well-made fake. @clausman: the current bid is $400 with five days to go on the auction. Score! And if it makes somebody happy to buy it then more power to them!